You've probably suspected it for at least the past several years, particularly if you have a preteen or teenage child, but now teens themselves have confirmed it: they're addicted to their mobile devices. According to a survey conducted by nonprofit organization Common Sense Media, one in two (50 percent) of teens say they are addicted to their mobile devices. What's more, nearly eight in 10 (78 percent) of teens check their mobile devices at least every hour, and 72 percent "feel the need to immediately respond to texts, social-networking messages, and other notifications." And teens aren't the only culprits when it comes to being addicted: According to the survey, "Technology Addiction: Concern, Controversy, and Finding Balance" 27 percent of parents say they're addicted to their mobile devices. When parents were asked about teen addiction to mobile devices, and vice versa, the numbers were similar: Fifty-nine percent of parents said teens are addicted to mobile devices, while 28 percent of teens said parents are addicted. 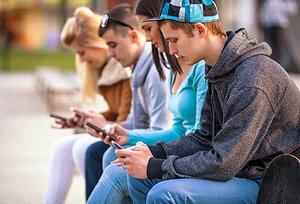 If there's any good news, it's that many teens and parents share a concern for doing something about their addictions: According to the survey, approximately one in two parents "very often" or "occasionally" try to spend less time consumed with their mobile devices, while approximately one in three teens do the same. For more data from this intriguing survey on mobile devices and the teen-parent dynamic in particular.